Is a practical easy to use sanitizer for spa and hot tub water. It rapidly and completely dissolves to provide effective bromine disinfection without cloudy or insoluble residue in the water. Is a super oxidation treatment to rid spa water of organic waste such as perspiration, body oil, cosmetics that tend to cloud water. Can be used as a pre-treatment to create a bromine bank in bromine spas and hot tubs. 1. Maintain recommended daily levels as determined by testing kit. 2. The filtration system should be maintained in order to ensure proper disinfection. 3. 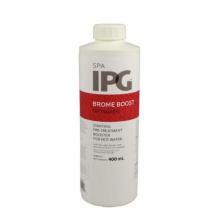 Apply 6 g of EASY BROME per 1,000 L of spa water directly to bather-free spa water with circulation system operating. Test for available bromine and repeat above dosage at 15-20 minute intervals until a residual of 3.0 – 5.0 ppm is reached. 4. Periodic superchlorination of spa water is recommended after heavy use, or once a week, in moderately used spas to remove organic waste. Apply 35 g of EASY BROME per 1,000 L of spa water as often as required. Bathers should not use spa until reading drops to 5.0 ppm. 5. Persistent foam formation, turbid, or malodorous water, are indicators of inadequate sanitizer levels. To correct such conditions, superoxidize water by adding 25 g of EASY BROME per 1,000 L of spa water. Maintain circulation at least 30 minutes and wait 4 hours before using. EASY BROME contains stabilizer (cyanuric acid) which will accumulate in spa water. Keep stabilizer within 30-100 ppm range by dilution with fresh water. 6. For proper sanitation, spa must be completely drained periodically. Maintain a daily bromine sanitizer level of 3 – 5 ppm. Use on initial fill of spa and weekly for maintenance. Can be used to pre-treat bromine spas and hot tubs. Each 20 g tablet provides effective bromine sanitation when used as directed. Is an effective disinfectant when used as directed. WARNING: Direct tablet contact may cause bleaching of vinyl, acrylic or synthetic spa surfaces. Automatic feeding devices employing these tablets must be totally free of other spa sanitizers to avoid the probability of explosion. 1. If using an automatic feeding device, fill the chamber(s) with tablets and adjust flow rate according to manufacture’s recommendations to maintain proper bromine residual. Adding tablets to the spa’s skimmer basket is an alternative bromine feed method. Daily usage should approximate 5 g of BROMINE per 1,000 L of spa water. NOTE: heavy spa usage and higher temperature usage rates may require higher usage rates to maintain proper bromine residuals. 2. Periodic superchlorination of spa water is recommended. Follow label instructions of superchlorination product being employed. 3. Persistent foam formation, turbid or malodorous water are indicators of inadequate sanitizer levels. To correct such conditions, superchlorinate spa water by adding superchlorination product. Maintain circulation at least 30 minutes and wait 4 hours before using. 4. For proper sanitation, spa must be drained periodically. Each 15 g tablet provides effective chlorine sanitation when used as directed. 2. Superchlorinate a freshly filled spa by adding 20 g of EXTRA per 1,000 L of spa water. Maintain water circulation for at least 1 hour before entering the spa (always measure your free available chlorine level before using the spa to make sure it falls within the recommended levels). Repeat superchlorination procedure after each use period. 3. If using an automatic feeding device, fill the chamber(s) with EXTRA tablets and adjust flow rate according to manufacture’s recommendations to maintain proper chlorine residual. Adding tablets to the spa’s skimmer basket is an alternative chlorine feed method. 4. Maintain proper chlorine residual by adding10 g of EXTRA per 1,000 L of spa water, daily or as needed. 5. Persistent foam formation, turbid or malodorous water are indicators of inadequate sanitizer levels. To correct such conditions, superchlorinate spa water by adding 30 g of EXTRA per 1,000L of spa water. Maintain circulation for at least 1 hour and wait 4 hours before using (always measure your free available chlorine level before using the spa to make sure it falls within the recommended levels). 6. Note on Superchlorination: EXTRA contains stabilizer (cyanuric acid) which can accumulate in spa water. Use of Spa Tab for superchlorination will raise stabilizer level at a faster rate. Keep stabilizer within the recommended range of 30-100 ppm by dilution with fresh water. Superchlorination with EXTRA will also lower total alkalinity. Make sure that the total alkalinity stays within recommended levels. 7. For proper sanitation, spa must be drained periodically. Test free available chlorine levels daily. Maintain a daily free available chlorine sanitizer level of 3 – 5 ppm. Check tablets regularly to ensure adequate sanitation and disinfection of spa water. For proper sanitation spa must be drained periodically. A practical and easy to use sanitizer for spa and hot tub water (dichlor). 2. Superchlorinate a freshly filled spa by adding 20 g of QUICK 100 per 1,000 L of spa water. Maintain water circulation at least 15 minutes before using. Repeat superchlorination procedure after each use period. 3. Maintain proper chlorine residual by adding 10 g of QUICK 100 per 1,000 L of spa water, daily or as needed. 4. Persistent foam formation, turbid, or malodorous water, are indicators of inadequate sanitizer levels. To correct such conditions, superchlorinate spa water by adding 30 g of QUICK 100 per 1,000 L of spa water. Maintain circulation at least 30 minutes and wait 4 hours before using. 5. QUICK 100 contains stabilizer (cyanuric acid) which will accumulate in spa water. Keep stabilizer within the range of 30-100 ppm by dilution with fresh water. Maintain a daily free available chlorine level of 3 – 5 ppm. Use weekly and/or as required to superchlorinate and to ensure safe and enjoyable hot tub or spa water. Test pH regularly and adjust to 7.2 – 7.8 to ensure proper water sanitation. 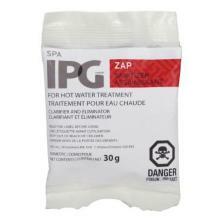 High performance liquid product for starting pre-treatment for hot water. Provides crystal clear water to allow spa usage rapidly. Will also eliminate coloured deposits from spa water and surfaces when used in conjunction with ZAP. Suitable for all types of spas. Provides bromine sanitation when used with SPA 2. 1. SPA 1 must be used in combination with SPA 2 to effect bromine sanitation in spa waters. 2. Initial dosage: Add 125 mL of SPA 1 per 1,000 L of spa water. 3. Weekly dosage: Add 30 mL of SPA 1 per 1,000 L of spa water. 4. Add SPA 2 as directed. Do not reuse empty container. Wrap and dispose of empty container with household garbage. For information on disposal of unused, unwanted product, contact the manufacturer or the Provincial Regulatory Agency. Contact the manufacturer and the Provincial Regulatory Agency in case of a spill and for clean-up of spills. 1st part of a 2 part sanitation system, provides bromine sanitation when used with SPA 2. Provides Bromine Sanitation when used with SPA 1. 1. SPA 2 must be used in combination with SPA 1 to effect bromine sanitation in spa waters. 2. Maintain recommended daily levels as determined by testing kit. 3. Add SPA 1 to spa water as directed. 4. Treat a freshly filled spa by adding 125 g of SPA 2 per 1,000 L of spa water to release bromine sanitizer from the bromide salt solution of SPA 1. Maintain water circulation at least 30 minutes before using. 5. 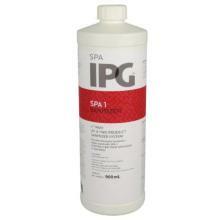 Maintain the proper bromine residual by adding 30 g of SPA 2 per 1,000 L of spa water, daily or as needed. Persistent foam formation, turbid, or malodorous water, are indicators of inadequate sanitizer levels. To correct such conditions, shock spa water by adding 125 g of SPA 2 per 1,000 L of spa water. Maintain circulation at least 30 minutes and wait four hours before using. 2st part of a 2 part sanitation system, provides bromine sanitation when used with SPA 1. Effectively destroys the organic residue in spa water. Is an oxidizing and clarifying treatment in one. Efficiently accelerates the elimination of organic contaminants in spa water. Re-activating treatment that restores the sparkle to spa water. Suitable for all spa surfaces. Is compatible with all spa sanitizers. Pre-packaged and pre-measured for ease of use and handling.